How does Gus’s World Famous Fried Chicken get to call their fried chicken “world famous?” Ordinarily, that would be quite a claim, but the restaurant lives up to the title. With twenty-five locations in eleven states, the chain that originated in Mason, Tennessee in 1953 has come a long way. Napolean Vanderbilt created a family recipe that he and his wife Maggie tested out of the back door of a local tavern, selling their chicken sandwiched between two slices of white bread. Eventually, with the help of devotees, a brick and mortar location was erected in Mason. After Napoleon’s death in 1983, Na’s son, Gus Bonner took up the helm and inherited the family recipe. Today, he and his business partner Wendy McCrory, have been spreading the love, opening franchises around the country. The recipe is a secret, and since the mixture is made by hand, it can vary slightly every time you taste the “world famous” chicken. One thing that is consistent is the answer if you try to ask for the ingredients, you will be turned down. While the ingredient mixture may not be a perfect science, the slightly spicy chicken is perfect every time, and every time, the plate is served with a slice of white bread. Location: Gus’s World Famous Fried Chicken 730 S. Mendenhall Rd., Memphis, Tennessee. Menu: The menu is simple, starters include fried pickles and fried green tomatoes. You can order individual pieces of chicken – breast, thigh, leg, and wings or plates that come with baked beans, slaw, and white bread. If you would like to add a side, you can select portions of beans, coleslaw, potato salad, seasoned fries, fried rice, or mac and cheese. For dessert, you can order a slice of pie: pecan, chess, sweet potato, old fashion, coconut or a scoop of vanilla ice cream. Thoughts: The motto at Gus’s is fresh, hormone-free chicken that is never frozen. Everything that is fried on the menu is fried in peanut oil. Other than that the secret recipe is the same in every location but can vary slightly by the day because all the food is made by hand. I visited the Mendenhall Road location in Memphis, and was struck by the small, plain, red-brick building with a sign at the top of the door that read “Gus’s World Famous Fried Chicken.” That was it. I probably would have passed it by if not for the line that extended around the corner of the tiny shop. Inside, the feel was clean but gritty, with plastic checkered tablecloths and neon signs decorating the walls. The casually dressed servers were wearing t-shirts with the “Gus” logo on the front, standing ready to pour sweet or un-sweet tea and offer refills when cups run dry. The menu is simple, some starters, fried chicken, sides, and pie. 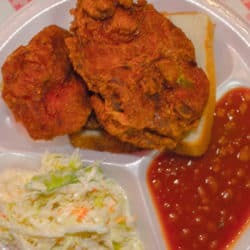 You can order by the individual piece or by the plate with either white or dark meat combos that come with beans, slaw, and bread. I ordered a combo plate and was treated to some of the best, fried, chicken I have ever tasted. It was crispy, spicy and it was so juicy that I considered ordering more. I thought the better of it. I did not expect the heat and even though I have sampled food with spice, the kick in the legendary crust was tasty. I enjoyed the sweet beans and slaw that made a great flavor foil for the chicken. If you don’t have time to sit, Gus offers patrons take out. When you eat at a local place that keeps the food uncomplicated, you feel like you discovered a gem. At Gus’s, they don’t serve any main dishes other than chicken, so the menu highlights what the restaurant does best. You won’t find fancy service or elevated cuisine at Gus’s, just flavorful, southern comfort food served with a smile. Price Range: A plate of starters costs around $5. Two and Three-piece combo plates with two sides range from $5 – 8 and a half -chicken costs $9. Drinks like soda and tea are refilled for free and beer is available if you dine-in. A slice of pie costs $2.25. Jeanine Consoli is a freelance travel writer, photographer, and foodie based in Washington Crossing, PA. A retired elementary school teacher, she used her summers to feed her passion for travel and kept journals of all the destinations she explored. Today, Jeanine is working as a writer full-time. She loves uncovering the history and understanding the culture of each location, including the local flavors of each unique place. She has traveled extensively in the United States and Europe and is excited to keep adding to the list, finding special places that are off the beaten path both at home and abroad.